Map: Unemployment in the Czech Republic, age 15-64, Jan. 31, 2018. Source: Czech statistical office and MPSV. The number of unemployed people increased from December 2017 (3,8%) to January 2018 (3.9%), but compared with January 2017, there are 100,000 fewer unemployed people in the country. “There has been a decline in the number of seasonal jobs, especially in construction and agriculture. As a result, the number of men who have registered at the Labor Office has increased,” the spokeswoman for the Labor Office Kateřina Beránková explained the January rise of unemployment. 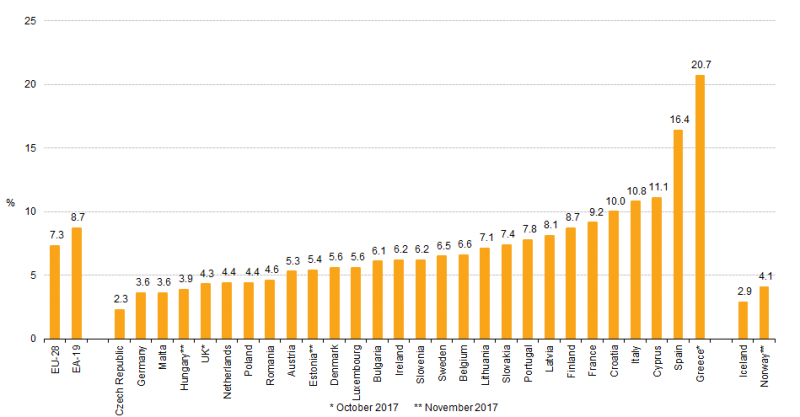 According to the latest EUROSTAT findings (Dec. 2017), among the EU countries, the lowest unemployment rates in Dec. 2017 were reported in the Czech Republic (2,3 %), Malta and Germany (both 3.6 %). On the other side of the spectrum, the highest unemployment rates were recorded in Greece (20.7 %, Oct. 2017) and Spain (16.4 %). Unemployment rates, seasonally adjusted, December 2017 (%). Source: EUROSTAT, Dec. 2017. In addition to the growing economy, improved employee recruitment techniques have contributed to the overall positive trend. “Many people with expiring fixed-term contracts registered in January. Also, a number of entrepreneurs and freelancers closed their businesses,” Beránková added. The highest number of vacant positions that are being offered by employers are in Prague (44,220), Central Bohemia (32,233), Plzeňský Region (22,319), Pardubice Region (22,152), and South-Moravian Region (18,787). In January 2018, the Labor Office of the Czech Republic reported a total of 230,728 job vacancies, which is 14,099 more than in December 2017, and 95,192 more than in the previous year.